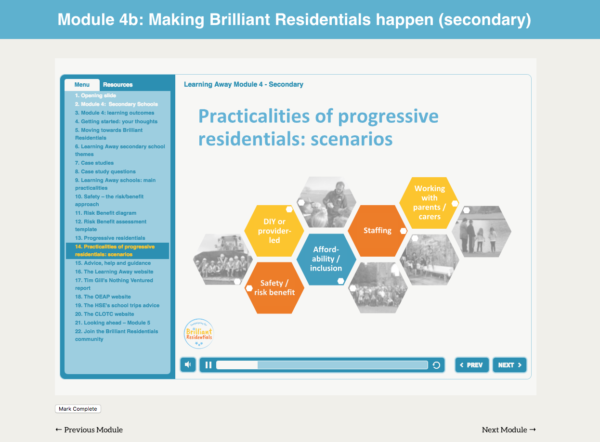 Our ‘Brilliant Residentials’ online learning modules are designed for schools, whether you are a Governor, senior leader, visit leader or teacher. The modules allow you to follow a suite of training at your own pace. They draw on the real-life experiences and learning of schools we have worked with extensively through the initial action research project, and include numerous opportunities for reflection and planning. There are 6 modules in total, each lasts about one hour. The modules give you the flexibility to complete the CPD in sections. The training is tailored to suit your needs whether you are from a Primary, Secondary or SEND school, or whether you have limited or more extensive experience of planning residentials. When you register for the online training you will be asked some simple questions which will personalise the modules for your needs. The entire set of modules giving you over 6 hours of learning is priced at £50. You can try Module 1 ‘Introduction to Brilliant Residentials: Impacts, benefits and evidence’ for free. Modules contain interactive slides, videos and a voice over expanding on the content within each slide. Module 2: Why are residentials brilliant? What is it about residentials that means they bring impacts and benefits that day trips do not? Why do residentials bring these impacts and benefits? What is a ‘Brilliant Residential’? How do Brilliant Residentials relate to your context? Module 3A is for staff with limited planning experience. Module 3B is for staff with significant planning experience.